This is Sunita from Nepal. Being a Nepalese, my country is crying for help, we are trying to take a step towards humanity and relief aids for the victims. 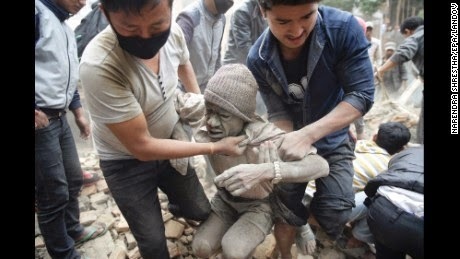 At least 3,218 people are now known to have died in a massive earthquake which hit Nepal on Saturday 25th April 2015. Hundreds of people are still missing. Rescue missions and aid have started arriving to help cope with the aftermath of the earthquake, the worst to hit Nepal for more than 80 years. We are trying to make an effort to help with whatever we can. Your small contribution can be a great addition to our cause. The collected sum will be utilized to help the victims of this disaster. The aftermath of disaster has left many people homeless, levering buildings, demolishing road and means of transport. They need food, sanitation, medical supplies and shelters. Please go to Earthquake Relief Fund for Nepal or Givealittle-Cause, Spark Foundation to donate. You can donate as less as $1 and as much as you want. Please keep supporting by sharing this among your networks. The Humanitarian Relief fund generated will be fully combined and the fund will directly go towards the affected communities.